Milwaukee Looking city to city, part of what is driving rents up to record highs and exacerbating the affordable housing crisis is the critical intrusion of large corporate ownership of single-family homes in some markets in addition to larger developments where they have always been a factor. The ACORN Home Savers Campaign has monitored this development in Memphis and Atlanta, but a recent piece in Bloomberg by Noah Smith confirms our deepest concerns. The backstory here is the one we all know well. The housing meltdown in 2007-2008 as part of the Great Recession led to millions of foreclosures of single-family homes. The rate of homeownership in the United States plunged from a record 69% before the crash to as low as 63% in 2016-2017. Fannie Mae and Freddie Mac dumped these homes in auctions. Some of these tranches were acquired by bottom feeders who wanted to off load them with various predatory contract for deed or rent-to-own schemes that have been the primary target of the ACORN Home Savers Campaign. In other cases, big private equity and corporate players bought the homes, perhaps originally hoping to flip them, but later coming to the conclusion that with minor repairs and upgrades they could milk them as cash cows for significant returns. Furthermore, in some markets where they were able to achieve density, despite still being a relatively small player in the overall US housing market, they could trigger significant rent increases in entire neighborhoods. 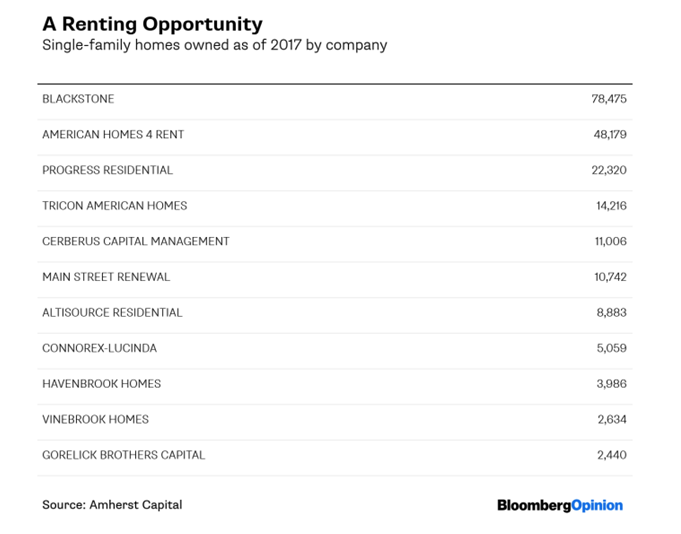 As the Amherst Capital chart in Bloomberg shows, we are talking about some big boy operators here starting with Blackstone, which is huge in Memphis for example, and including the notorious Cerberus among others like Tricon. Furthermore, the buying frenzy in this part of the market is increasing with researchers finding almost 9% of the rental housing market now under corporate control, even though the biggest dogs have less than 1% they are consolidating. Frighteningly, reports indicate that they have also begun to securitize these rent-bearing properties for investors which triggers a cycle that bears no good tidings for renters, affordability, or the cities where they are concentrating, particularly in the Sun Belt. could contribute to the rent crisis now afflicting many of the nation’s big cities. Wall Street landlords may also compromise quality. 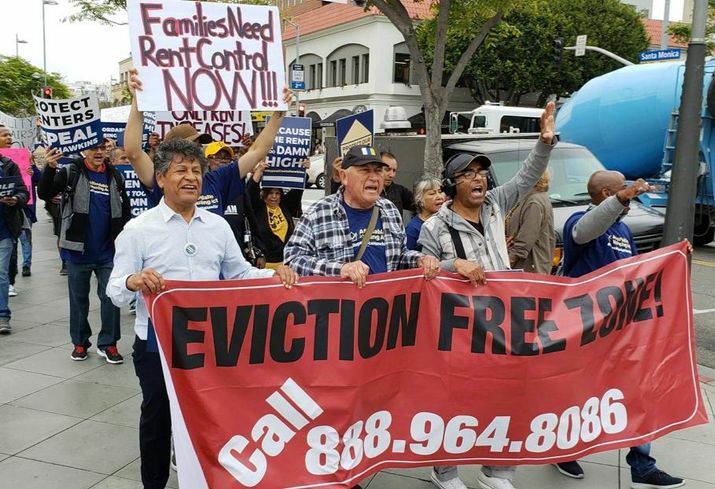 Their local dominance may afford them the luxury of simply ignoring tenants’ needs, especially in cities without strong protections for renters. But the most troubling impact could be on the American Dream of homeownership. Increasingly, young Americans looking to buy houses will be competing with big corporate landlords. There are a number of reasons that competition will not favor the aspiring homeowner. Big landlords have cheap financing at their disposal — securitized bonds, REIT share sales — while individuals have to rely on mortgages. Big landlords may also value a house more, due to the high rents that their local market power lets them to squeeze out of tenants. Most Americans tend to have the bulk of their wealth in their houses. If fewer young Americans are able to buy homes, they’ll miss out on house price appreciation, and the gains will go to corporate shareholders, who tend to be rich people. Thus, the rise of the Wall Street landlord model may put a damper on U.S. middle-class wealth accumulation. For tenants and potential homeowners, none of this is good news, and I would argue with Smith that these developments pose real national dangers. New Orleans A paper by Eric Seymour and Josh Akers in the Cities journal ranked the density of various forms of land contracts that have surged to the forefront in low income areas since the 2008 financial crisis. This brilliant paper aligns with the work of the ACORN Home Savers Campaign’s findings in the field on the doors. Seymour and Akers crunched the data correlating where such contracts, REO foreclosures, and race all converged in patterns that leave little room for debate about where predators were feasting with the help of Fannie Mae auctions and other fire sales in lower income, minority neighborhoods. The highest concentrations were in the in the zone around Detroit from Toledo to Flint and Pontiac. The second highest was between Cleveland and Youngstown. Third, was Cincinnati and Dayton. The fourth finally broke out of the upper Midwest with pockets in St. Louis and Kansas City, but the maps showed it was everywhere. We had been on the doors in a majority of those cities and could see the faces behind the numbers as people opened their doors. This is a story writ large over generations. Reading contemporary memoirs, it is not surprising that if the writer was African-America and came from rough and tumble, hardscrabble beginnings, not infrequently contract home purchases were part of the tale, as much for the predation as their precariousness. Although Charles Blow has never mentioned it in his New York Times columns, one of the many poignant stories in his memoir, Fire Shut Up in My Bones (2014) mentions that his mother packed he and his siblings up to flee an abusive situation when he was a child coming up in northern Louisiana. Underlining how bad it was, he noted that she was leaving a house she had bought on a land contract when it only had one month to go before she would have gotten the title. I wrote Blow begging him to write a column about this, but there was no response, which also says a lot as well. A new book, The World According to Fannie Davis: My Mother’s Life in the Detroit Numbers, by Bridget Davis is getting a lot of favorable attention. Davis emphasizes how open her mother was about her business inside her home with her children, and how important it was that all of that be kept secret from the world. In fact, the driving force for Davis telling her mother’s story is to honor her mother’s commitment and reveal the secret. Reading the book, one discovers quickly that there was another secret that was equally important, personal, and precarious, like her mother’s illegal business, and that was the fact that they were on a month to month land contract. In order to escape even more risks and even higher interest and payments, her mother had made a deal with someone she knew with better credit to absorb the land contract and paid him in cash every month. Bridget Davis is clear it was predatory, and her childhood memories read like fresh scars as she writes about how much they loved the house and the neighborhood, and feared on a monthly basis that because of the land contract they could lose it all and everything they had put into it overnight with no recourse. The story from the outside about what racial discrimination and exploitative real estate contracts have done to communities around the country is a picture of state-sanctioned evil, but the story from inside looking out from the children’s perspective that is now being told as part of lived experience is also tragic. Please enjoy Patty Griffin’s Where I come From. Thanks to KABF.